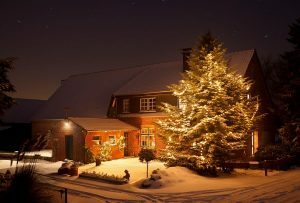 It’s long been thought that properties don’t sell during the winter, with people’s thoughts turning to Christmas and avoiding going outside unless it’s necessary. However, there’s nothing stopping you hitting the market in December – you could be in your new place by spring! You just have to think smart. This means clear of snow, leaves or mud, depending on the weather. If you’re expecting snow, then sprinkle salt and grit on your path and front step so it’s always visible and safe. Make sure, if the weather’s warmer, that it doesn’t get muddy or covered in leaves. A daily sweep or hose-down should do the trick. You should also use a good-quality outdoor doormat to absorb rain and mud, as well as a container for wet umbrellas. Open the curtains as much as possible, make sure the windows are clean inside and out and turn on all the lights and lamps, even in cupboards and closets. If you have any rooms that don’t get much natural light, use spotlights behind furniture. If it exists, clean it! Scrub the grouting, remove any limescale you can find on any surface and re-seal the bathtub. Polish mirrors, light switches, doorknobs, plant-pots and bins; clean the fridge, freezer and kitchen cupboards and even the fruit bowl! If it’s cold and damp outside, then a warm, well-lit interior is heaven on earth and buyers will instantly like the place! Set your thermostat for a degree higher than usual, light a fire or your log burner and hand out some hot chocolate. You need viewers to imagine themselves living comfortably in your house, so use lots of plush cushions and throws in the downstairs rooms and bedrooms. Have some spiced hot chocolate, coffee or baking on the go so that the place smells of winter comforts – don’t forget to hand these treats out though. Winter isn’t a time for open windows, it’s true, but this doesn’t mean you have to drench the air with chemical smells. Instead, open the windows for a quick blast of fresh air an hour or so before a viewing, then shut them and turn on the heating and light the fire half an hour before people arrive.